On Tuesday afternoon, 29 July, Henrik Bredmose gave a talk on recent work on impact of waves on walls and hydrodynamic loads on cylinders at the Danish Hydraulic Institute. Impact on walls was characterized by the amount of aeration and scale effects. On the boundary between low aeration impact and high aeration impact is the flip-through impact, first introduced by Cooker & Peregine (1990). Accelerations near the flip-through impact have been recorded at 10,000g. Experimental results obtained in 2008 at Plymouth University were shown to illustrate the phenomena. Numerical results simulating the experiments were shown. The agreement was qualitative, but the pressure peaks in the numerics were typically much smaller than the experiments. The second part of the talk was on hydrodynamic loads on cylinders. Here three features were of interest: ringing (Grue & Huseby (2002)), impulsive excitation, and effect of large flexibility. 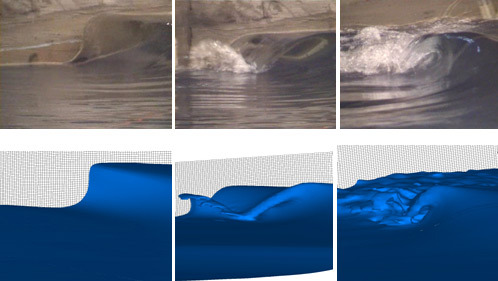 Results were compared with a fully nonlinear potential flow solver OceanWave3D. The most extreme accelerations were found in wave breaking of large amplitude waves in shallow water. A video of the talk is available here.